← What’s a first look? Wedding Fashion for Men: How to pick the right suit! To be completely honest, guests will probably rave more about the bride’s wedding dress than the groom’s suit. That doesn’t mean you shouldn’t look your absolute best! It’s your wedding too, after all. Here are a few tips that the wedding pros at the waterfront Historic Kent Manor located on the Eastern shore of Maryland have come up with. There’s a difference between a suit that fits vs. a suit that is flattering on you. For example, if you’re short and thin then you should stay away from double-breasted jackets, shawl collars, and anything with too many buttons. You should look for jackets that will work with your body type and elongate you, like a jacket with a low button stance. For more information on figuring out what’s best for your body type, we suggest the following articles. If you’re of average build and most suits or tuxes look great on you, then it’s an easy and more affordable option to go with renting. Unfortunately, not every man is built the same and not every suit jacket is going to fit properly. If this is a problem for you, then we HIGHLY suggest that you buy your tux or suit and get it tailored to fit you accordingly. It is after all, a once in a lifetime occasion so make sure you look good! 4. Are you following fabric rules? Most suits today are made from wool because it’s versatile, comfortable and wrinkle-resistant. Depending on the weather and the style of your wedding, you may choose to wear a suit with a different fabric. Other popular fabrics we’ve seen are cotton and linen. Cotton is a very durable fabric but unlike wool it won’t keep you warm during the winter, so if you’re planning on having a winter wedding then this is NOT for you! Linen is a very light-weight fabric best used for summer weddings but unlike the other two fabrics, this one creases very easily (and no one wants wrinkled clothes in their wedding photos). There you have it! 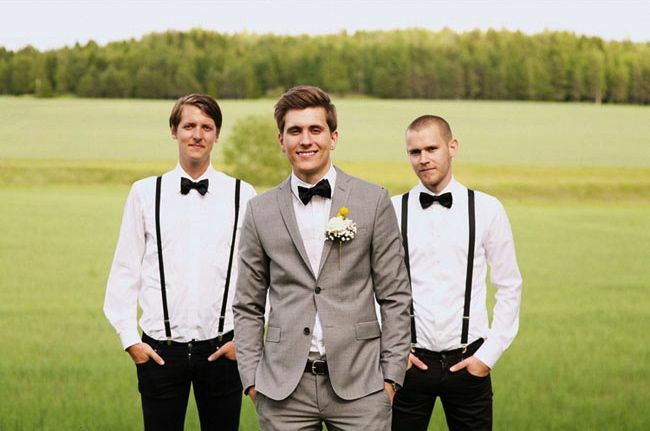 An easy, step by step list of things to consider when picking out groom (or groomsmen’s) outfits.